thanks for this extension robin!! a couple questions, how do we check if a rewarded video ad is available? ...in my game over scene i have a "watch video" button that only is created if a chartboost rewarded video ad is loaded, i want to also create that button if a heyzap rewarded video ad is ready to be shown, is it possible? You can use also the Heyzap interstitial ad is load block. I need to rename that block. You can use that block for interstitial, video and rewarded video. A question, so whenever you show an ad, heyzap chooses a random provider from your list that is available and shows their ad, correct? And after you display enough ads, you can then customize priority? It's so much more easier to work with one extension rather than using multiple extensions for each provider. The debug tester is also the best thing ever, seriously. I ran into the compile error and followed your guide and it worked. Thanks a bunch, greatly appreciated. Yes thats correct, but the SDK for each provider has to be installed. You can use existing extension like Leadbolt, Adcolony, Admob, charboost and just only enable the extension, in this way the SDK will be installed amd you can use the Heyzap blocks. (Not the blocks of each extension) this make it easy to use. You can use the debug tester to test it..
i know it detects both interestitials,video ads and rewarded but if i put that block to check if a rewarded video ad is available it can throw a "false" true because an interstitial ad can be available when what i want to use is a rewarded video... am i wrong? and about what dtrungle said, so i can use only the heyzap blocks if i have more than one ad extension? do we have to add in the heyzap dashboard which ad networks are we using so they can pick up ads from all those networks and in stencyl do we have to enable all ad extensions or what do we have to do to have multiple ad providers for heyzap ads, i'm not understading how it works.... ? Yes you right, i don't know if i can chance that because all ads using the same delegate callbacks. I can make a extra block to fetch a interstitial ad before you can show a interstitial ad, this way you can play with different fetch and show blocks. Give me same time to make this. Second, Yes just enable the networks in the dashboard and fill in the id's of the network. Then Only Enable the extension in stencyl and use the Heyzap blocks. See also the wiki page i made, hope that explanes some more. i have read your wiki page now but still have some questions xD, i saw that with heyzap we can use even unity ads, vungle, applovin ..and much more..but in stencyl we have extensions for only some of those networks, i assume that we can only use the ones that we have extensions for them ? so the steps are installing all those extensions, and enabling only heyzap in the extensions setting of my game in stencyl? or do i need to enable all of them before using only the heyzap blocks? .... im confused because i read your previous answer to dtrungle and you said that we have to have each sdk installed and i dont know if i download the sdk of unityads and copy that in the extension folder will the heyzap extension recognize it? I have to look first if its possible to create extra blocks to check separately availability. - You have to install all extensions and enable them all not only Heyzap. Because you enable them all Stencyl will automaticly install the SDK's of the networks you enabled. Then you only need to use the Heyzap blocks. - You cannot download IOS SDK's from Networks where no extension of exists. 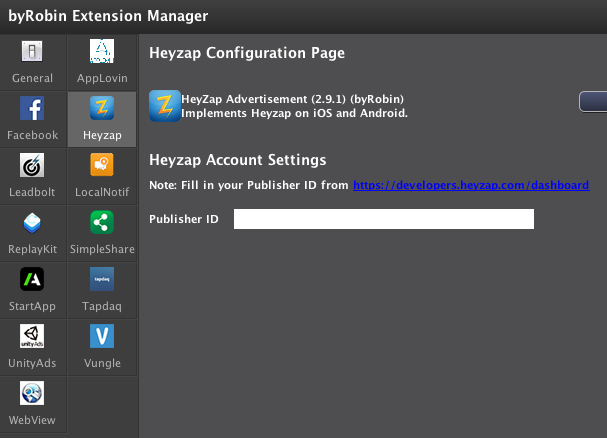 Like UnityAds, and copy that in the extension folder, the heyzap extension will not recognize it. There has to be some recode first to get that to work. - But for Android you can i think, just download Android SDK of UnityAds and copy it to "engine-extensions/heyzap-master/dependecies/heyzap/libs" enable it in Heyzap dashboard and fill in you App ID. I think this will work, but not tested yet. yes robin, thank you very much, you are awesome !! So is this mediation or just hey zap advertising? If you haven't already, click the individual network, enable them and provide the IDs/Keys, and then hit the save button. The circle to the left of the network should be green. I haven't tested tested this much but I know I got the heyzap ad to show. What I tried was the debug block for chartboost. I believe at this point heyzap randomly chooses a network, and if the network has no ad to serve heyzap will do nothing aside from logging in console. you have to enable each ad network both in stencyl and on heyzap dashboard. in the other hand just for testing purposes i downloaded the unity ads and vungle sdk and both were detected by heyzap using the debug block, but for using them more things are needed like activities and manifests...i just write it so everyone knows. I didnt test chartboost but i succesfully enabled admob and facebook audience network and i was able to show ads using the debug block.